I like to think sailing is a lot like art. In both, you have to be present at all times. 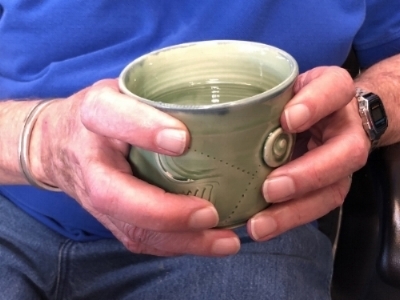 You have to experience the feelings, textures, the changes, and the shifts and think ahead to the next wind line or what glazes would work best on the piece in your hands. There are lots of words to learn, new concepts to conquer, and things that in the light of day harken back to basic school room science: the boat heeling, the clay warping; the amount of things going on at the same time and how to manage it all in the moment. Maybe that’s what fascinates me about both, the living in the moment part. Sometimes we’re in our heads so much that we can’t find our way out. Digital devices seem to be taking over our lives and we live in a world of impersonal reactiveness. 15 knots of wind and a perfect day to play on the water. Inspiration just happens. Art-making and sailing both take me to a place of awareness. It’s hard to worry about the past or think about the future when you have to concentrate on every nuisance of the moment to steer the boat right now, or how to keep the large lump of clay from going off center and throwing itself into chaos. When I’m in the moment, I become quiet in order to better recognize what’s happening around me. Nature tells a visual story and I am looking for her words, to better understand her secrets and how they translate into my art. Sailing my boat is the same, where all the senses are engaged. I sit on the coaming with the tiller in my hand and I feel the push and pull and the mystery of the eons. 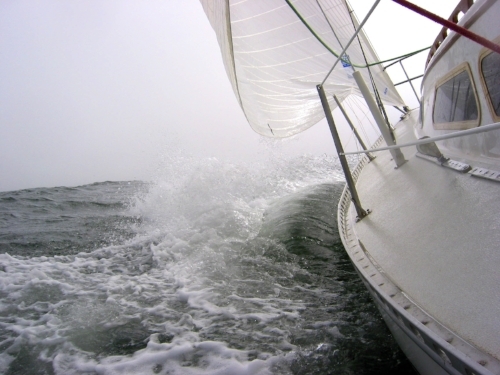 I feel the swell coming up behind me and adjust the tiller ever so slightly to take advantage of how that swell will move my boat effortlessly closer to where I want it to go. My eyes are constantly searching the water looking for signs that will help me sail better. I listen to the water as the boat glides through it and hear the splash of the bow waves when the winds increase. The air is healthy, the scenery beautiful. It is an exercise of the mind, to push the tiller to the right in order to go left and vice versa. Do I pull the sail in or let it out? A simple question, but a world of difference. Sailing, like art requires the doers to learn their craft. There is much more involved than buying bags of clay or taking a few sailing lessons. Both involve more than just an understanding of how to fire a kiln or how a boat uses the wind to move through the water. Both require an appreciation of the multitude of details and how they work (or don’t) together. Time on the water gives me the ability to look around me. The multiple textures of Morro Rock, the colors of the land and sky often collide in inspiration – ideas that come from seemingly out of nowhere, arrive with silent fanfare as a result of being in the moment – in nature. Then like sailing the long, last leg of a race with very little wind that can take hours to get to the finish line, the idea has time and percolates and can be adjusted in my imagination. Somewhere between getting a new idea and actually making the art, is the time for introspection, exploration, processing and refining of the original idea. The sails are filled. The engine is off. I feel the wind and water take over. The culmination is the actual art-making, and the questioning. Is the piece working the way I imagined or how I intended? Did something go wrong, did something not work, or did something unexpected happen, and what can I learn from that? Some of my best work has come out of failed attempts that forced new explorations that were eventually successful. When a person spends years learning a skill they begin to do much of it in an unconsciously competent way. They no longer wonder if they pull the tiller one way, will the boat go where they want it to go. They just know, they no longer have to think about it. Certain parts of art-making come from the unconscious. There are parts that are mechanical and down-to-earth, and very much on the conscious level. When I work on a piece of art I stop, look, study and question, moving from the unconscious mind to the conscious, to judge the progress and to see if the piece works, or not, or isn’t there quite yet. And I continue to explore. Art doesn’t just happen; there is a process, a definite trajectory from here to there. And sailing seems to provide my Muse and excite my curiosity. It helps me get to the place I need to be to produce robust, one-of-a-kind art that satisfies me, and hopefully you. There's lots to do to get ready for a big show. Work needs to be created, finished, bisque fired, glazed, and then made ready for display. Drinking a beverage from a handmade tea bowl just tastes better. The weight, texture, comfort and overall aesthetic contributes to the taste — and there’s no other container that fits as perfectly in your hand as a ceramic mug. With what is increasingly referred to today as “mindfulness” being a much-desired quality for many people, it's not surprising original, one-of-a-kind art is being sought out for their mental and even physical benefits. We want to see, feel and touch something made by an artist, to feel the human connection and be reassured it is still there. People are moving away from the mass produced item and seeking out the unique and personal one instead. When you buy ceramics from an artist, you're buying more than an object. You are buying years of learning and practicing. You are buying originality and authenticity — the skill of the maker with the magic of their imagination. When we use an “artist-made” piece, it becomes a celebration of our contemporary lives and gives us a connection to ancient artisans and to those of the future. I work by hand and with a potter’s wheel. My work ranges from clean lines to heavy texture; from gesturally organic marks colored with oxides, to layers of highly refined color with rich finishes. Some is artfully functional and some is sculpture. Some pieces are sassy and others refined. Find ceramic art that resonates for you. Give them as gifts or take them home. Do NOT just put them away in a cupboard. Use them. Love them. Handcrafted small-batch ceramics are everywhere these days. You see them in trendsetting boutiques, restaurants and in pages of popular magazines like Vogue. Just as those earlier trends represented a tactile, down-to-earth counterbalance to our sped-up, technology-centered world, the rejection of factory-produced sameness in dinnerware and vases reflects a desire to get back to something more essential. It’s entwined with the farm-to-table movement. It’s this desire to know the origin of what’s in your kitchen. We want to know where our free-range eggs come from, and where our coffee beans are grown and roasted. We also want the vessels we use to consume those things to embody a deeper story about craftsmanship and creativity – we want to know the artists and the farmers. People are looking to have their humanity reflected back at them, and are moving back from slick and stainless steel to something warmer, more personal, something with meaning in the midst of our nano-second, fast-paced world.